Awesome place! Right on the edge of Waikiki so it wasn't to loud which I really loved. Loved the fact that it took me barely 10 minutes to walk to the heart of Waikiki and I was just around everything I needed to be. View was ok. But for the price it's hard to match! Room was clean and everything felt clean. Very nice outline of the room and definitely loved the check in process. Wonderful stay at this condo in Ilikai. The location was perfect. The condo is well taken care of and clean. The views from the lanai were awesome. Only thing that could use improvement is the mattress on the bed which was rock hard. Wonderful view and accommodations. All kitchen utensils and appliances were there and worked. Towels and sheets were fine. Really nice location overlooking the garden and marina with a distant view of the ocean and great sunsets! The street noise was kind of loud but the fountains covered the noise. Thank you for the hospitality! This is the second time that my husband and myself have stayed at the Ilikai in unit 427. The location is great, close enough to everything in Waikiki but far enough away from the crowds. It is also within walking distance to Walmart which makes it easier (and cheaper) for buying groceries and anything else you might need. 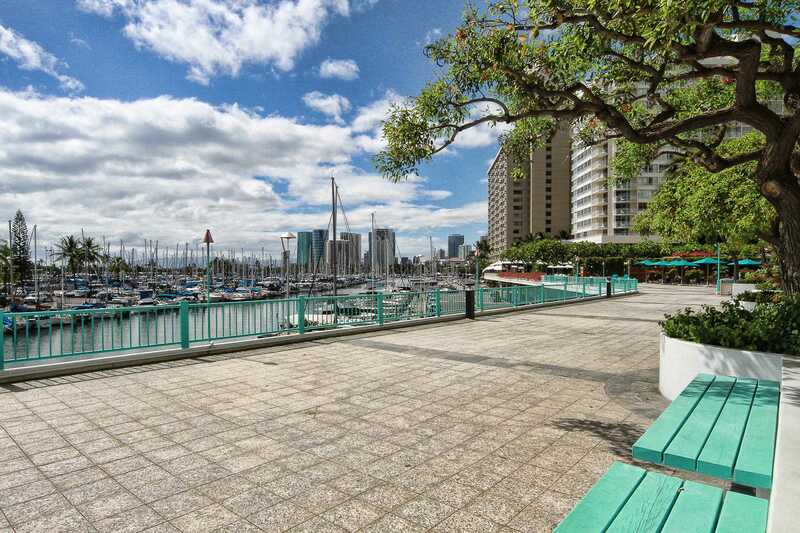 The condo itself is clean, quiet and has a nice view of the marina and the ocean. We love the pool on the 2nd floor as it has lounge chairs situated right in the pool which is great for cooling off. One of our favorite things is when Richard Bell comes at the end of the day and blows the conch shell and lights the torches which he has been doing for over 50 years. There is also a really good restaurant called Cinnamon's and we eat there often. We love the Ilikai and we can't wait to go back again. 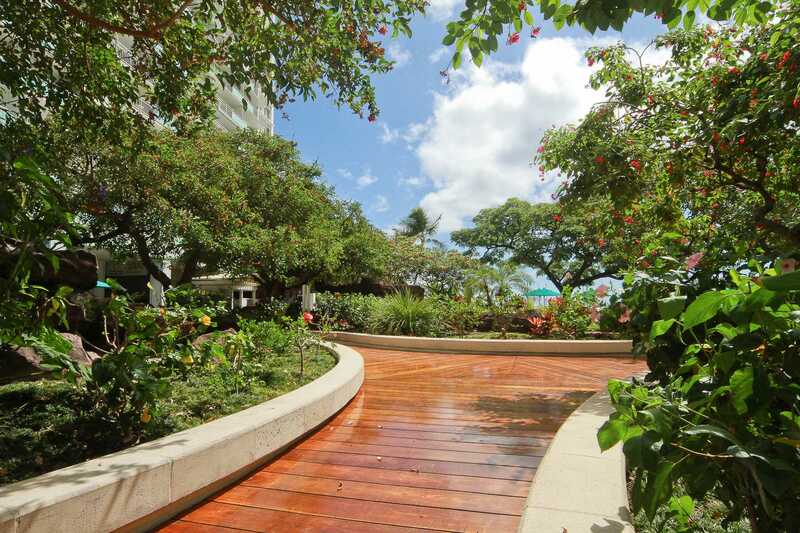 Fantastic condo stay in Honolulu! The place you stay can make the biggest difference in the world - even in paradise. We have been to Hawaii many times this is top notch, made the whole trip the best.- very clean - adds to the experience from the moment you step in- well appointed - no lack of towels, dishes etc. didn't feel the need for anything - best location - close to everything yet calm- suite location perfect - beautiful view of the boats in the harbour, and evening sunsets - not too high up. You can enjoy the sights, feelings and smells of Hawaii right there- no fuss check in and out - arrived later in the evening, followed the email code, walked in settled in minutes- bed is super comfortable - self explanitory** No question, when we go back, no need to look anywhere else. We would book around this condo's availability. We enjoyed our stay and hope to come again and stay. The location was excellent. . Would sin the same place . The location was perfect. Not in the throws of the mall but close enough to easily get to the action. Everything in the room was in great condition, clean, and the AC unit worked extremely well. I will be staying again! Thank you!! The stay was great and the place was perfect. I would definitely look to book again and will recommend to friends. I stayed in 427 and absolutely loved it!! Very well equipped and had a beautiful view! Close ti everything you would need..
Beautiful spot to stay,nice a clean,lots of space,and a beautiful view,we loved it and we will be back next year,everything is in walking distance,lots of shopping,awesome dining,excellent place for breakfast in hotel,and all of the tour bus's pick up in front of ilikai,we stay at the ilikai every year,Mahalo! Fantastic. Best location. Great condo. Highly recommend! Suite was very clean with comfortable bed and living room furniture. We had a fabulous 2 week vacation in Waikiki staying in room 427 of the Ilikai. The property was exactly as shown in the photos and the descriptions were accurate. Keyless entry worked flawlessly. The room was clean and quiet. We would definitely stay there again and have no hesitation in recommending it. We had an excellent stay everything was straight up and clean, no issues and a fair price. Our condo has a beautiful view as described. Thank you, we will consider you next time. My husband and I had a wonderful time staying at the Ilikai. It is a beautiful property in a fantastic location. The staff was very helpful. Everthing you need or want is within walking distance and the views are incredible. "Much better end of town, best access to everything, PLUS save heaps." What a fantastic place the Ilikai Apartments are. These apartments/hotel were built in the 60's but they are far nicer, cleaner and decorated far better than some I have stayed in that are only a matter of a few years old. The management of the Ilikai are VERY house proud and there was never anything out of place, dirty or unkempt. Bright paintwork, beautiful decorations that fit perfectly, friendly staff everywhere. I would not hesitate to recommend this place to anyone traveling to Hawaii, We would stay there again without hesitation. Access in and out is first rate wether young or old, mobile or in a wheelchair. Access is superb. Bus stops in both directions directly outside. So getting to and from the Ilikai is so simple and easy. 5 minute walk to the largest outdoor mall in the southern hemisphere. When doing tours, you are the first collected and the first dropped off. One point collection and drop off zone, with English speaking people doing the collections. Free Wi-Fi, that once connected, will reconnect without fail the moment you walk into your apartment. Beautifully maintained pool with attendants on duty. In house shops in the lobby. Super clean room, that is fully stocked with everything you need for your stay. Including towels, face washers, beach and pool towels and soap. Super hot water that didn't run out. Clean appliances that were all in 100% working condition. Free local phone calls from the room. A place I would be happy to live in and own, very well maintained and very clean. Access code used for the front door, so no need to take a key anywhere (to lose) plus once all checked in on line, you just go directly to your room, no need to stand in any queue at reception, punch your code in and the door opens. Fantastic idea that works perfectly. The marina view is stunning, and there was even a full 4 place table and chairs on the balcony, plus beach chairs if you needed to use them. As mentioned in the title, this is at the other end of the Waikiki strip, but for us as older travellers, it was much nicer. No heavy foot traffic outside. No loud rabble of young party goers. However it is only about a 10 minute walk or 5 minute trolley ride to the centre of all the fun if that is what you like. This place is not jammed in tight like some of the other hotels that are right in the heart of Waikiki, and the place feels really up market as well. The savings are huge. By staying in an apartment where you keep it clean yourself, you can save thousands. By comparison with a fully serviced hotel/resort, we saved many dollars over our 10 day stay. This made great sense to us, as we could then afford to do more tours, restaurants etc. 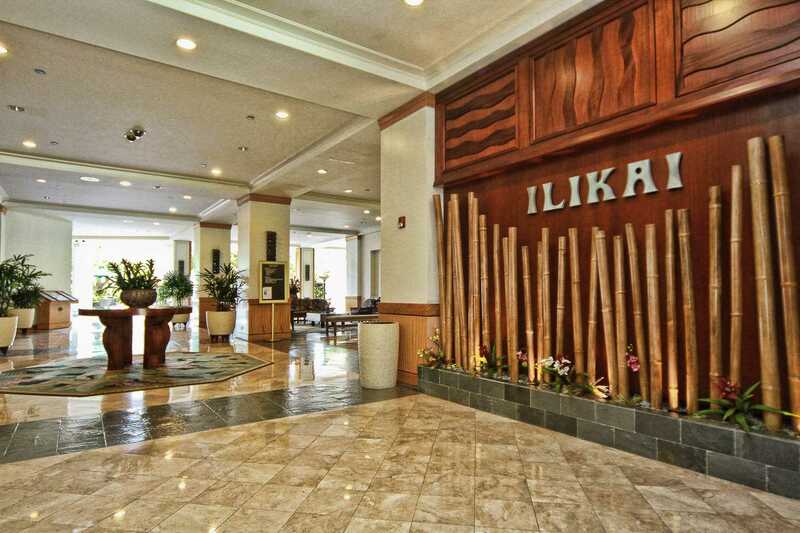 The Ilikai Hotel and Suites is in an excellent location. 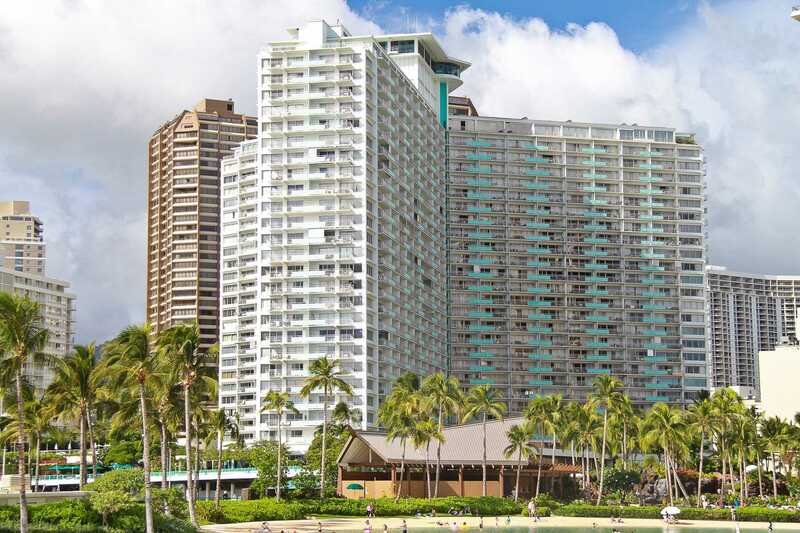 We were able to walk to Waikiki Beach in less than 20 minutes along the beach and to the Ala Moana Shopping Center in less than 10 minutes, where a main bus transit stop is located. Bus travel is easy and relaxing on Oahu. We did not rent a car and were still able to travel to Kailua and the North Shore easily for day trips. The hotel room worked out well for us, two adults with two children, because of the kitchen. It was comfortable and clean. The kitchen was adequately stocked with only one drawback - there was just one bowl. We would certainly stay again. The hotel is almost adjacent to the Hilton but is considerably less hectic and 1/3 the price. Thank for the feedback. Glad the condo worked well! The instructions & list posted on the door encourage our Guests to just call if there are shortages like missing bowls. We rented this unit for a week and were not disappointed. The apartment sports a well-equipped kitchen and bathroom, a large open living and sleeping space, a nice balcony with a great marina view, and basic beach supplies (which came in handy). 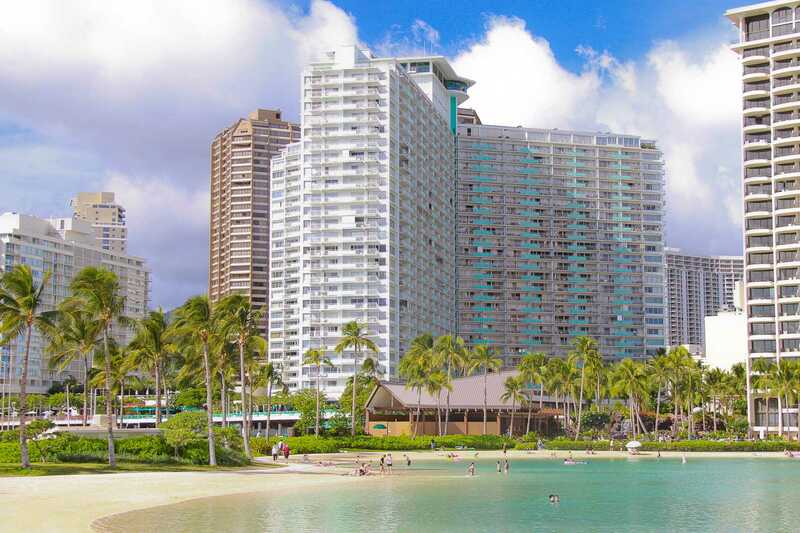 Its location was convenient both to the beach and shops in Waikiki and Ala Moana, as well as to the Honolulu conference center (where I attended a week-long meeting). I would definitely rent again under a similar situation and recommend it to others. Agree with others that the pool was unremarkable and often crowded; but that did provide the motivation to walk a few blocks to the real beach. We stayed for 18 nites in March/April 2015. Good size studio with all the amenities of home. The suite allowed plenty of light into the unit. The only issue I had was the hotel reception would not accept a courier package for me because I wasn't a hotel guest nor did they provide any solutions for me to receive the package. It was a replacement credit card so it was rather urgent. Also, they should consider providing access to the gym for a fee. Overall, we were pleased with the unit and it's proximity. Response: The Suites are not part of the Hotel. We always suggest OUR Guests to call our Local Contact phone number listed in instructions, and posted on the door so we can help with these types of requests. We are available to help with any concerns. The condo was exactly as described. Great location. Fully equiped kitchen. Very clean and confortable. Great view. Very big bed. Best honeymoon ever! 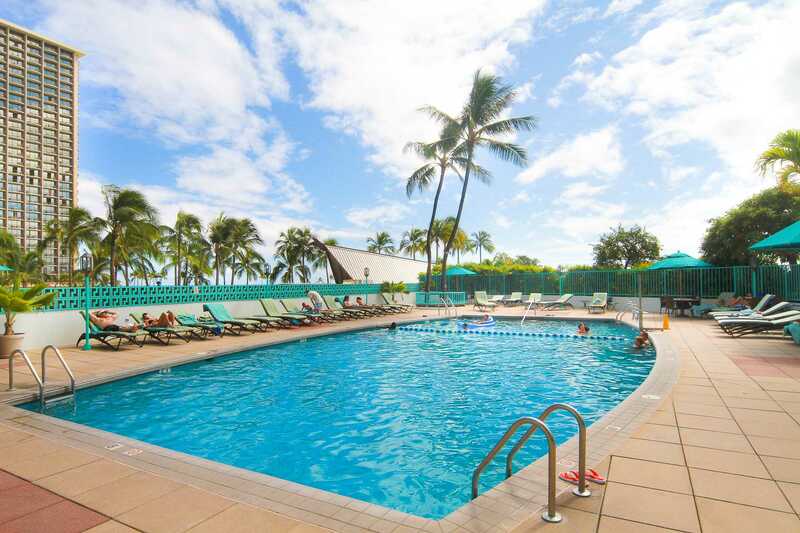 We use to stay at the Ilikai Hotel years ago and remember it well and we were not disappointed in fact the room had been refurbished very clean and was nicely presented, everything was there. The view from the balcony over looked the garden of the hotel and you could hear the waterfall below and beyond that the Marina and the beautiful sunset, we loved sitting on the Lanai watching the sun go down. What a wonderful stay...we did not want to leave! We felt perfectly at home here from the minute we arrived from our 24 hour journey from London! Condo was lovely and exactly as expected and keyless check in was completely hassle free and our stay here passed smoothly with no issues. Previous reviewers have mentioned some noise from the lift, which is next to the apartment, but this should really not deter anybody from staying in this condo...it was very quiet only occasionally heard a very faint 'ding' when doors opened. 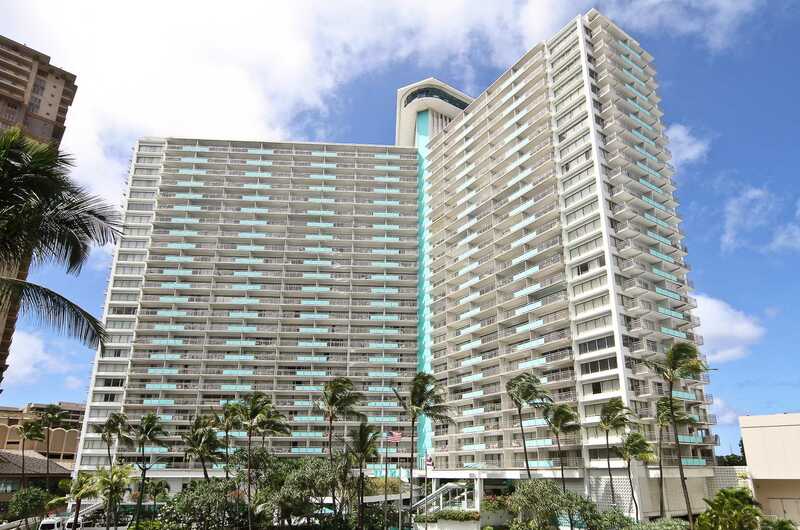 The condo was very clean and well equipped and the Ilikai building itself also very clean and had all the ameneties we required, with the laundry room very close by, which was very handy. The lanai was great, lovely to sit out in the morning with a coffee. Our only very small criticism would be that hanging closet space here is very limited, so would suggest not bringing too many clothes that need hanging, but other than that would thoroughly recommend. All in all, a wonderful stay and will return at our soonest opportunity. Thank you to the owner and all at Hawaii Vacation properties. We had a wonderful 11 day holiday staying in suite 427. The view from the lanai was wonderful! We had great views of the marina and beach, and spent many evenings sitting on the comfortable swivel chairs on the lanai drinking Malibu and guava juice watching the sunset. We didn't have a rental car but were able to walk everywhere in Waikiki. The room was clean and tidy with start up provisions. We needed to buy toilet paper the toiletries the day after arriving. Thank you for a lovely holiday. 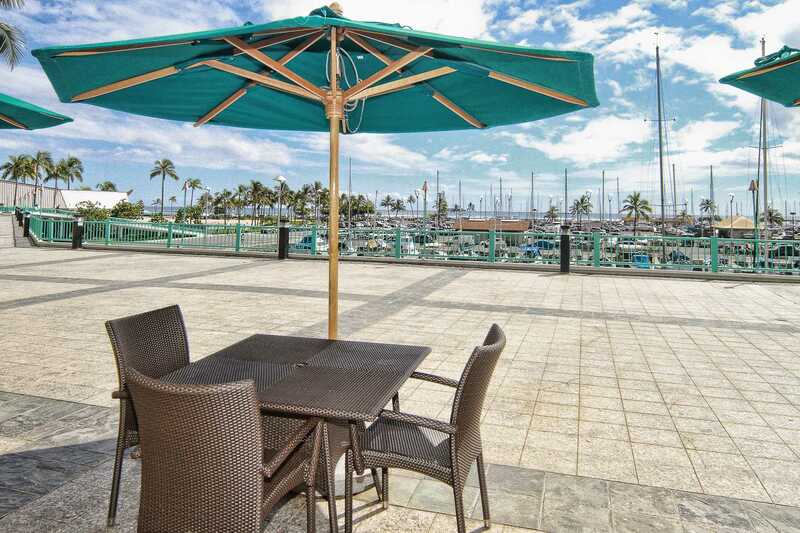 The Ilikai has a great location, away from the busy-ness of the main part of Waikiki. 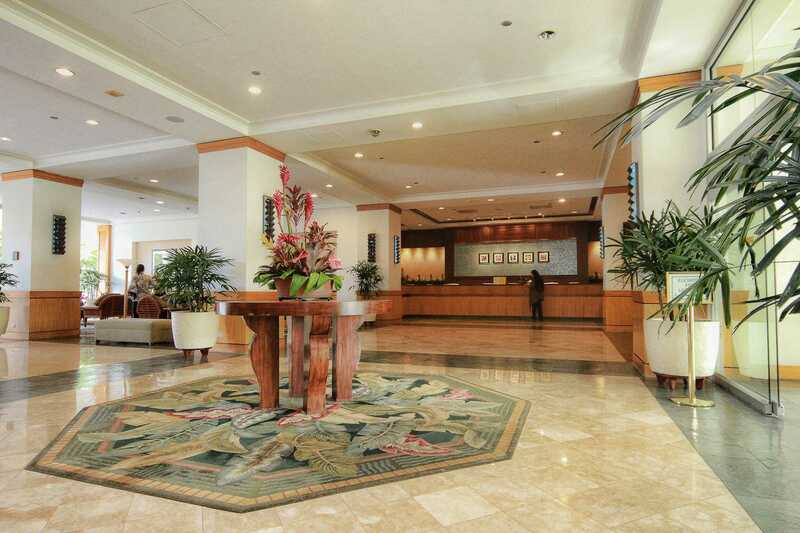 The hotel lobby and common areas are delightful - you really know you are in Hawaii. The view over the marina from this unit was lovely and the unit itself was very nicely appointed, with good quality linen and towels and was very clean. Highly recommended. Only doing 4 stars because the unit is on one of the lower floors and doesn't have the ocean view but it was wonderful in all other ways. We loved our stay at the Ilikai Condo on the 4th floor. The owner was very good at communication. The condo was lovely and nicely updated and clean. The Ilikai itself was lovely too. There were nice shops in the lobby and a great restaurant outside. The pool is clean and nice. I can't say anything bad about the place. The entertainment was good too and the fireworks a bonus. We would surely stay there again. I stayed at this 4th floor unit with my 16 year old son. Apparently the sofa bed was very comfortable as was the main bed. There was adequate room and the condo, especially the kitchen, was well appointed It is right next to the lift well so if you are a late sleeper you might notice lift noise from about 7 am onwards. The Lanai is nice and quiet as the room is on the Marina side of the hotel. All in all a good stay with the room being as advertised. My husband and I just enjoyed a wonderful 10 days in this apartment. Our first visit to Hawaii and we were very happy with our choice. The communication and instructions made our arrival very easy. The apartment was everything we had expected - clean, comfortable and convenient. It was close enough to walk into the centre of Waikiki but far enough away to be quiet at night. The concierge was very helpful and organised all our trips even though we were staying in a private apartment. Fantastic! We had a pleasant stay in your apartment, the very pleasant, clean(appropriate) apartment, placed well in front of port(bearing) and very close to the beach(range), with a lot of comfort. The excellent value for money, we had all the advantages of the hotel (restaurant, swimming pool, caretaker, stores), very nice and pleasant staff of the hotel, we shall return to Hawaii and we shall still reserve in your hotel rather in front of lagoon. The condo was perfect, it had everything that was needed and the comfort of your own home. I would highly recommend a stay there as the location was also perfect. Clean and bright and all the information laid out at hand if needed. I will definitely be booking this condo again. Mahalo. Sep 22, 2013 by Jan 07, 2012 from Mike K.